A couple of months ago I stumbled across 2 curious watches, the Junkers Bauhaus 6060 and the Graf Zeppelin Hindenburg LZ129 7060, during my usual scouring of stores for new and interesting watches. What stood out about these watches was their use of a modified Miyota 9100 movement, their interesting designs and their relatively moderate price of $550. At first, my eyes were locked on the Bauhaus 6060 watch, as it had elements of Max Bill design to it that are very appealing. So I wrote a piece about them, which you can read here, focused on the 6060, but touching on the Zeppelin LZ129. But after the post ran, I started to dwell on the watches and thought that something this unique really needed a hands-on to further explore the details and qualities of the watches. 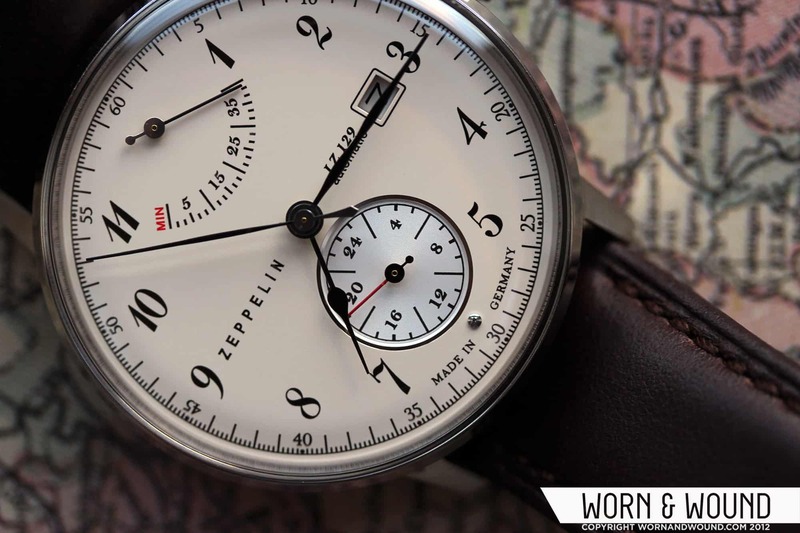 Though I initially was focused on the 6060, the Zeppelin LZ129 just began to call out to me as really unique watch, one that didn’t just intrigue me intellectually, but rather as a watch that I could see owning myself. So, I contacted longislandwatch.com, one of the few US distributors of the brand, about getting a sample for this hands-on, which they were more than happy to supply me. The LZ129 is packed in a medium to small black box with a foil-stamped Zeppelin logo that is made of coated paper and black faux-leather. The box is of good quality and is certainly protective for the transport of the watch. The inside of the box is all black faux-leather, has a black pillow for the watch to be attached to and a pocket that contains a small instruction pamphlet and a 2-year guarantee. The guarantee is a bi-fold pamphlet that is designed to look like a Zeppelin ticket, which is amusing, and has the story of Zeppelins and the brand inside. Though we’ve seen watches with much more extravagant packaging, the LZ129 is packed well and the box is small enough that it is easy to keep around. Long Island Watch also throws in a buffing cloth for good measure. The LZ129 immediately impressed me. The dial is flawlessly executed, the case is polished evenly and the strap is supple and stitched well. Not that I had any reason to expect otherwise, but having never seen a Graf Zeppelin in person, I did not know exactly what to expect. Needless to say, the build is at least on par with other watches in this price category. That being said, the watch is not a sport watch or a diver with extra-thick everything, it is a casual to dress watch with an elegant stature. It is fairly light and has a large domed Hesalite (or acrylic) crystal, which is beautiful but can be susceptible to damage. While everything is sturdy, well machined and well put together, I do think this is a watch that should be considered as somewhat fragile. While this does not mean I had any concern wearing it in normal daily activity, I would not wear it while moving furniture or let my 4-year-old cousin play with it. Though the Miyota 9100 movement is an automatic, I opted to hand crank it initially to test the responsiveness of the power reserve and feel the quality of crown and winding stem. In both cases I was very happy with the results. The power reserve immediately responds to winding, with the movement kicking in after a couple of turns, the crown is sturdy and the stem turns smoothly with adequate resistance. The polished stainless steel case has a 40mm diameter, which places it in the small to medium range for a contemporary watch, and given the early 20th century aesthetic of the brand, the case size feels right for the look. The design of the case is very different from other watch we have looked at on the site, which tend to have flat or semi-rounded sides. The LZ129 actually tapers outwards from the case back towards the top of the watch. At about 2/3 to the top, it flattens out for about 2mm where the lugs meet the case, and then tapers back in until it reaches the crystal. The overall effect is quite interesting. On one hand, the watch feels very slim, at about 11mm thick, but the taper upwards makes it appear as though it is high on the wrist, as it is widest towards the crystal. Visually, it is a very elegant design that grants the watch an air of refinement. The case has a display back that very smoothly transitions from the main case, creating a soft and comfortable surface for the wrist. The case back is held on with four small screws, has various information etched around the edge and has a 27.25mm aperture for viewing the movement. The domed Hesalite crystal is one of my favorite design features of the watch. It spans 38mm, making it run the case almost edge-to-edge, and it stands off the watch just over 2mm, giving it a lot of presence. Not only does the crystal have the right aesthetic for the period of this watch, it acts as a vitrine for the dial, presenting the information within. Practically speaking, it also has great optical clarity when viewed at most angles and low glare. Though the Hesalite, which is acrylic, presents a higher potential for scratching, I don’t think it cheapens the watch at all. In fact, like with my Helson Skin Diver, I believe it adds value to the watch by being so aesthetically well matched. It is also easy to buff shallow scratches from daily wear with some polywatch. The dial of the Zeppelin LZ129 ref. 7060 is simply blissful; it’s one of those dials that you can’t help but ogle all day. It is full of information and details that have been expertly laid out to achieve clarity, taste and an appropriately antique style. The model I received is cream colored with black indexes and a silver 24-hour sub-dial. There is a lot to look at on the LZ129, but everything is well balanced, so the information never overwhelms. Starting at the outer-edge, there is an index for the minutes/seconds that is broken down to 1/5th second increments. There are larger marking for every minute/second and numerals every 5. Aside from providing precision to the watch this outer index does 2 important things: 1. It adds an instrument aesthetic to the watch that tempers the otherwise dressy components, 2. It provides a terminating line for the dial that helps give the dial a sense of containment. Moving in, the hour index consists of a very attractive, slightly italicized serif font that runs 1-5 and 7-11, with power-reserve and 24-hour sub-dials at 12 and 6, respectively. The font they used reinforces the early 20th century aesthetic of the brand and the watch as a whole. It also touches on a marine chronometer aesthetic that is very appealing. There is also a very small metallic half-sphere at 6 that splits the words “made in” and “Germany”. This is a subtle detail that I happen to find captivating. At 3 there is a rectangular date window with a black rectangle for a border. The date disc is silver colored with black text. I was very glad to see that they put in the effort to do a date disc that would meld with the styling of the dial. The power-reserve sub-dial, located at 12, is arranged in an arc ranging from “min” to a line representing 40 hours. There are numerals and long lines alternating every 5 hours and individual smaller lines for single hours. “Min” is marked in red, and the only color on the dial (aside from the 24-hour hand), giving it extra significance. The dial is very easy to read at a glance, though given it is indicating power, one generally just needs to see that it is somewhere above zero. Nevertheless, it is well executed and enjoyable to look at. The power-reserve hand is a long straight black needle turns silver at the center and has a small circular counter on its backside. This gives the power reserve the feeling of being a meter of sorts, which plays to the instrument-esque design of the dial. The 24-hour sub-dial, located at 6, is a stroke of genius. In subtle contrast to the cream of the main dial, this sub-dial is a silvery grey and is set into the main dial, giving some needed depth. While not being made of metal, to my knowledge, it does have a metallic glint to it that sets in apart from everything else as well as a metallic bevel around it, making it feel less like a sub-dial and more like a secondary mechanism. The index of the 24-hour dial consists of long markings and numerals alternating every 2 hours, with the numerals starting at 4. There are also smaller markings for the individual hours. The font used here is also a serif font, but less ornate than that of the main hour index. The overall look of the dial is very much like the small-seconds dial of marine chronometer. It has a purposeful feel to it and adds a visual center-point to the dial. The 24-hour hand is small, black in the center and red going towards the index. The main hands of the watch are in the “poire” style, which is a classical look defined by a pear shaped bulges on the hour and minute hands. The second hand, while very slender, too has a slightly bowing to it, creating a softer and almost more humanistic form. They contrast well with the needle style hands of the sub-dials, creating a visual separation between functions. Given the classical aesthetic of the hands, they work with the serif font of the hours to create a dressier feeling to the watch. That combined with the instrument-like indexes and sub-dials create a very interesting look that traverses from formal to casual. One cool detail of the hands is that the edge of the domed crystal makes the hands appears as though they point down towards dial at their edge. This is the first watch we’ve come across with the Miyota 9100 movement in it. The 9100 is a 9015 with a few added complications. In its full form it has standard 3 hand time-telling, date wheel, power reserve, 24-hour and day and month sub-dials. It also features 26-jewels, automatic and hand winding, hacking seconds and 28,800 bph. For a movement that clearly is affordable (given the end price of these watches) it really packs a lot of high-end features. The 9015 is already being used as a stand in for the ETA 2824-2, now that ETA is withdrawing third-party sales, so I imagine the 9100 will be getting a lot of use soon too. For the LZ129, they modified the movement to eliminate the day and month sub-dials. I personally think this was a smart move for a couple or reasons. First, the watch has more than enough going on as is. By not including those complications, they allowed the dial to be more focused. Second, the functions that remain are all very useful. That is not to say the day and month indicators don’t have a purpose, but in terms of immediate functionality, power reserve and 24-hour are more practical. Granted a GMT sub-dial would be even better than a 24-hour dial, but this still serves a purpose. In the few weeks I have had the watch, I have noticed no inaccuracy with either the time keeping or power reserve. The movement also features slight decoration by way of Geneva stripes on a plate under the rotor, like the 9015. While that is a nice touch, and the movement is thoroughly enjoyable to look at (what movement isn’t), I wish they had done something to the rotor. Even if it was just an engraving of the Zeppelin logo, the rotor is a big, flat piece of steel with little visual interest. The LZ129 comes on a 20mm chocolate brown leather strap with matching stitching. It has a slightly padded design that goes well with the look of the watch. The strap itself is well made, quite comfortable and seems to be decent quality leather. While it is not the most exciting strap, it suits the watch and is a good “starter” strap for the watch. I could also see it on a gator style strap, or a subtle pilot style strap, perhaps with contrast stitching. The watch is a great wear. The 40mm size is extremely comfortable and given that the dial runs nearly edge-to-edge, it has great wrist presence. The cream coloring is very versatile, and looks great in both formal and casual settings. I think this would be a natural fit under a grey blazer or with a pair of jeans. It does have a somewhat delicate appearance to it, so I wouldn’t wear it with hiking gear, but I think it’s a perfect to the office and out for dinner type watch. My suspicions about this watch were dead on. Graf Zeppelin created something very unique in this price range, featuring both interesting design and unique features. When looking at watches in the mid-500 price range, there tends to be a lot of redundancy in terms of functions and style. There are tons of divers and tons of pilot watches, but not too many watches that just stand apart. Having a power reserve, a 24-hour dial, good early 20th century marine-like looks and solid build-quality come together to make a great piece. And if these looks don’t do it for you, the Junkers Bauhaus 6060 is basically the same watch with a different dial, hands and a very different overall aesthetic. Fantastic review! I love this watch for two reasons: The dial itself is extremely unique and looks very high-end. Second is the movement and ability to manually wind it for fun. It is worth noting that there is an identical version with a white dial and a black strap. The Reference number is 7060-1. No comment on the accuracy of the watch? Thanks! I’m glad you like the watch and the review. I briefly mentioned the accuracy in the movement section. My test for accuracy is very simple, I wear the watch for a while and see if there are any significant issues. If the watch “keeps time” enough that any derivation is unnoticeable, then I consider it as accurate. Of course that is only for general time telling. If I had a watch with COSC approval or a claim of better than average accuracy, I would test it more thoroughly. So, this watch passes my test for daily wear and use. The power reserve also seems accurate to the actual charge held, though the needle does dip below “min” when empty. I love the look and price point of this watch but for that price I feel it should come with sapphire crystal not hesalite. Nice watch. On a unrelated note I would like to see you guys review a Seagull, and maybe some lower end chinese tourbillons. Thanks for the comment. We did take a look at the Seagull 1963 a few months back. Maybe we’ll get our hands on one of those MontieK tourbillons in future. I’ve never understood why people just don’t get crystals on vintage styled watches… This is gorgeous because it has a domed Hesalite crystal and would be ruined by a flat sapphire. They’re too shiny and clear. Look at a Speedmaster with Hesalite vs. sapphire – just too much bling. I’ll take cheap to replace, cracks vs. shatters, and can be polished with toothpaste any day…. Very nice watch. Perhaps too much text on it. I just bought this watch and was wondering if the movement also made quite some noise when you tested it. It seems you didnt’ talk about it, but I was a bit surprised with mine. You can really hear the rotor moving when you make gestures with the watch on your wrist. Maybe I have to get used to it but it’s really much more noisy than my Le Locle. Very nice appraisal. I also keep an eye out for unique watches, and my view of this one is very simple. I want this watch! Thanks for the review. I actually want to buy one, but would you recommend having an engraver engrave some text or logo on the rotor? As you said it yourself, it looks a bit flat and I wonder if I could make it look more interesting? That could be fun…some sort of pattern or filigree. Great review and I really like the style. But its just too small for me. Any recommendations for something very similar around the 44mm mark? Comments suggesting that “it ought to have sapphire” are predictable. Fact is, many enthusiasts, especially older ones, prefer “plastic” crystals, for the reasons you mentioned. It has a different look, allows more complex shapes, and, if it gets a scratch, you just buff it out. It’s related to the stuff they make aircraft canopies out of, so it must be pretty tough. The requirement that all higher end watches have sapphire is relatively new, and due as much to marketing as to function. Awesome review! I was kicking around getting the 100 year dual time big date. What do you think about that swiss ronda quartz 6004.b movement? I know it’s the same that even tag Heuer puts in the lower end formula one line. Any thoughts? FIrst I have watched your Steinhart OVM review and found myself buying one last week. Now I have to get this!! Great review, I’ll definitely get this one too, looks really elegant and different. Moar reviews pls, you doing really good! Now that you’ve had a hands on with this I’m curious which color you favor. Still the white on cream or this one? I am thinking about buying a similar but not the same zeppelin, I just wonder about the power reserve. As indicated, there is a power meter on the dial but it seems like we only have 35 minutes reserve. So am I right to say if i do not move much during the night the watch will be inaccurate or even stop the day after ?. Moreover, I want to ask whether this is a drawback if I compare it with watch from Christopher Ward (http://www.christopherward.co.uk/men/dress/c5swt-mk2.html) which has 28 days reserve power. This information make me quite unhappy with the movement of zeppelin. Please reply soon. just watch the video once again, it seems like i understand the word “min” on the watch in the wrong way. It stands for minimum not minutes, so thanks you anyway. which one do you advice? I have a Zeppelin 7680-1 that i got just over a year ago. I was caught in an unsuspected downpour last night, and water actually got inside my case. There appears to be no damage to the watch, however there is now condensation on the underneath of the crystal. Has anyone else encountered this? Seems odd that water would get in just from rain, given the watch is water resistant up to 5 atm. Would this be covered by the warranty? Hey great article and review. I bought one and now am slightly concerned as the script writting on the strap is a different font and also the number on the back are making me think i bought a fake. Can you give me any key signs to look out for? a “German made” watch with a cheap Mitoya movement. This watch is a total ripoff!